Nursing Home Abuse and Neglect in D.C. The U.S. Department of Health and Human Services estimates that over 1.5 million people reside in nursing homes or assisted care facilities. About one in four Americans may need to live in a nursing home one day. Increases in the aging population may correlate with increases in nursing home abuse and neglect. The World Health Organization estimates that over 15 percent of people 60 years or older have faced abuse. Nursing home neglect and abuse occurs for various reasons. One of the more common reasons is when the facility is understaffed. This may result in staff becoming overworked and fatigued, affecting their work performance. Inadequate training is another common reason for nurse home abuse. Incompetent staffers may not know what to do in specific situations, which may result in unintended consequences for residents. Physical abuse involves injuries such inflicted upon a patient. Scars and bruises are potential signs of physical abuse. Sprains and broken bones may indicate severe physical abuse. Mental abuse can be as harmful as physical. This includes the berating or insulting of residents by staff. Emotional and social abuse may involve isolating a resident for an indefinite amount of time. Residents may develop anxiety and depression as a result. Nursing home staff may even sexually abuse residents. However, other residents or even visitors may conduct these actions as well. Neglect consists of the failure to provide adequate care. This could mean that the resident is poorly fed, left with poor hygiene, or not getting out of bed as frequently as they should be. Wrongful death may even occur if abuse and neglect becomes severe enough. Neglect may result in the development of bed sores (also called pressure sores) in residents. This is one of the most common consequences of staff neglect. They may result in a severe infection or even death. 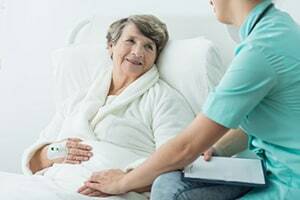 The inability of a patient to move around is the most common reason why bed sores are not uncommon in nursing homes. Bed sores are ulcers that are caused by pressure put on someone's skin due to immobility and malnutrition. They may result in specific areas of the skin that feel numb or painful. Bed sore severity is rated on a scale ranging from 1 to 4. Grade 1 bedsores are prevalent, and consist of skin turning red. They are also known as a decubitus ulcer, which can resolve fairly quickly. A grade 2 decubitus ulcer consists of compromised skin. Grade 3 bed sores consist of further compromise of skin that is more noticeable and requires serious medical attention. Grade 4 bed sores consist of an infected ulcer, which further necessitates medical attention. Treatment of bed sores consists of surgical removal or tissue or wound care. Moving someone in bed or getting them out and moving also helps a bed sore from developing. Ensuring that a nursing home resident is well-fed is important. However, the best way to avoid bed sores is to ensure that a nursing home has enough staff that provides the best quality care possible. Nursing Home Abuse Claims in D.C.
Washington, D.C. can provide favorable outcomes for those filing lawsuits against nursing homes. Its jurors are empathetic towards a plaintiff's situation. Interestingly enough, The District has no cap on the amount one can receive for pain and suffering. However, you must take a few steps when making a claim against a D.C. nursing home. Contact a local attorney specializing in nursing home cases. They will assess your situation, and answer questions you may have about how to proceed further. The burden of proof to prove abuse or neglect rests with the residents themselves or their family members. This requires ample evidence showing that the nursing home failed to provide adequate care for the resident. They must also prove that a staff member's actions resulted in a resident's injury or death. One such way to prove this is through medical records that indicate the severity of a resident's injuries. Another is having an expert witness testify that adequate care and attention under similar situations would not have resulted in a resident's injuries or death. Nursing homes have a "duty of care," that makes them accountable for their residents' safety and well-being. To hold a nursing home in Washington, D.C. liable, one must have enough evidence to show that they failed in fulfilling this. The plaintiff must also show that that this resulted in a resident's injuries or death. Examples of such evidence includes inadequate medical care, improper administration of medications, failure to adequately feed and hydrate residents, and bed sores. Anytime someone is considering a lawsuit against a nursing home for abuse or neglect, one of the key questions is how much that lawsuit might be worth. You should not feel bad about wanting to know the value of your claim. A civil lawsuit is ultimately about money. To evaluate how much a nursing home case might be worth in Washington D.C., have to look at sample verdicts and settlements from cases in similar jurisdictions. D.C. has a comparatively small population so there are not as many nursing home verdicts or settlements from D.C. compared to other jurisdictions. Moreover, not many of the settlements in nursing home cases in D.C. cases get publicly reported. Nursing home cases in D.C. rarely go to trial; they usually settle before the parties ever see the courthouse steps. Below are some nursing home verdicts and settlements from other jurisdictions that have somewhat comparable laws. Wasserburg v Menorah Nursing Home (New York 2018) $300,000: elderly man is under the care of a nursing home and rehab facility just outside New York City. He has respiratory issues and needs to be hooked up to a breathing tube and ventilator. The staff at the nursing home neglect to properly monitor his breathing tube and ensure that his airways are clear from mucus. A blockage develops as result of this neglect and he dies from cardiopulmonary arrest. The nursing home facility denies that they were negligent but a jury in King's County finds that they were and awards $300,000 in damages. Doe v Defendant Nursing Home (Massachusetts 2017) $275,000: 82-year old nursing home patient is unable to walk or move and bedridden. He already has signs of possible bed sores when admitted to the nursing home but the staff fails to take any special measures to move him more frequently and apparently doesn't bother to move him much at all. Soon after his admission he is diagnosed with a Stage IV pressure sore (which is the most severe level) with signs of related infection. He is sent to a hospice and dies a few weeks later. The nursing home claims that he developed a spontaneous ulcer that was unpreventable but the medical records produced in discovery suggest otherwise. The nursing home agrees to settle for $275,000. Brinson v Nursing Home (New York 2016) $150,000: 83-year-old woman with numerous health issues is a resident at nursing home for 3 years. During that 3 year period she had to be transferred to a local hospital 4 separate times for severe dehydration and malnutrition. Each time she went to the hospital her condition was remedied within a week only to repeatedly reoccur several weeks after being sent back to the nursing home. She eventually dies from complications related to her malnutrition and her estate sues the nursing home for negligent care. The jury finds that the nursing home's care violated New York's Public Health Care law and awards $150,000 in damages. Estate v Defendant Facility (Massachusetts 2016) $1.3 million: 72-year-old female is a long-term resident at a nursing home outside of Boston. Over a 3 year period at the nursing home she falls and injures herself 40 separate times. 4 of the falls require hospitalization. Following the last incident she suffers a subarachnoid hemorrhage and dies 3 months later. Her survivors sued the facility for negligent supervision, negligent training and negligence in failing to follow physician's orders. The case is settled out of court of $1.3 million. Washington D.C. is one of our firm's home jurisdictions and all of our lawyers are barred in D.C. If you think you may have a case involving nursing home abuse or negligence in D.C. call us today at 800-553-8082 or contact us online for a free consultation. We serve the following localities: Washington, D.C. including Adams Morgan, American University Park, Brightwood, Capitol Hill, Chevy Chase, Cleveland Park, Columbia Heights, Congress Heights, Dupont Circle, Foggy Bottom, Georgetown, Logan Circle, Manor Park, Mount Pleasant, Near Northeast, Petworth, Riggs Park, Shaw, Shipley Terrace, Sixteenth Street Heights, Southwest Waterfront, and Washington Highlands; Montgomery County including Germantown and Rockville; and Prince George's County including Bowie, Laurel, Landover, Hyattsville.